Well, friends, this may be the fastest turn-around in the history of the blog. As I sit here typing this I am still sipping on the very blood orange margarita that I took pictures of just moments ago. Truth be told, I took the photos 2 hours ago, but I am such a light-weight that I drink most of my drinks very slowly! Anyways, I had to get this post up today because, by a sheer stroke of luck, today happens to be National Margarita Day! This is actually a wonderful coincidence because I had no idea it was National Margarita Day until about 30 minutes ago. Now I no longer have to feel guilting about drinking at 2:00 pm on a weekday because really I am just celebrating the holiday! 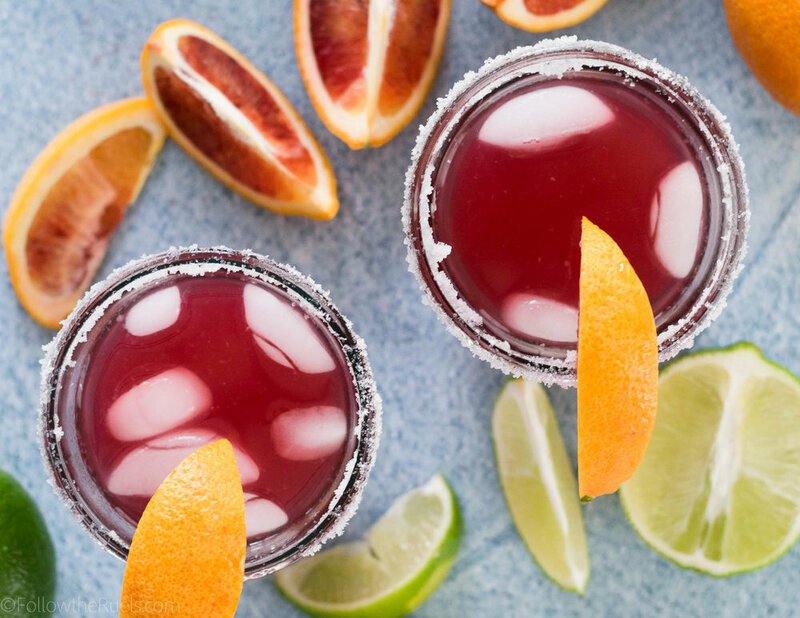 And this blood orange margarita is a delicious way to celebrate! You have all of that on hand, right? No? Okay, I will wait here while you go to the store and get them. Alright, now you are ready to make some margaritas! Juice a blood orange and a lime and then measure out 2 ounces of the juice. Combine the juice with the agave syrup (or your sweetener of choice) and tequila. If you have a cocktail shaker, it's time to dust that puppy off and shake your margarita mix with some ice cubes to get it nice and cold. If you are like me and do not have a cocktail shaker, just stir it around in a large glass until it's chilled. I personally like a salt rim. If you are, too, you will want to rub a lime wedge around the rim of your glass then dip into some coarse salt. 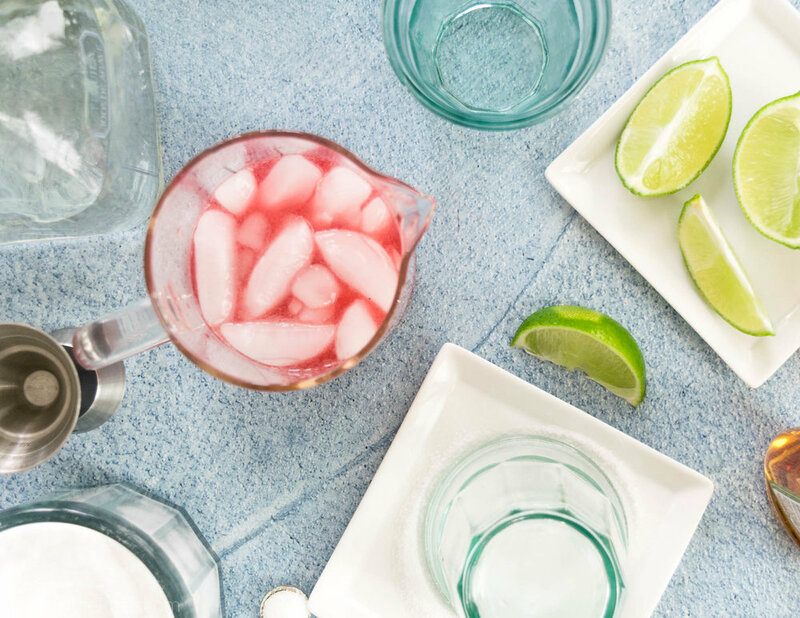 Once your glass is ready, you can pour in your blood orange margarita! Now you are ready to celebrate with me! Combine the juices in a small glass. Measure 2 ounces, or 4 tbsp, of juice and pour into a cocktail shaker or large glass. Add in the agave and tequila as well as a few ice cubes. Shake or stir until chilled. Spread the salt onto a small plate. Rub the rim of two glasses with a lime wedge. Dip the rim into the salt and move around to cover rim. Pour margarita into the glass and add a few ice cubes. Adjust the amount of tequila based on how strong you like your cocktail. If you do not have agave, you can substitute with granulated sugar or simple syrup.